An auction of shirts signed by wildlife expert Steve Backshall opened on eBay today to raise money for World Land Trust (WLT). The 17 different shirts – 16 T-shirts decorated with wildlife designs and a safari shirt – have all been worn by Steve. They are sized men’s large and are all are signed by him. Each shirt will be dispatched with a signed photograph of Steve. Steve wore some of the T-shirts while training for BBC’s Strictly Come Dancing in 2014. Others he has worn at public events. 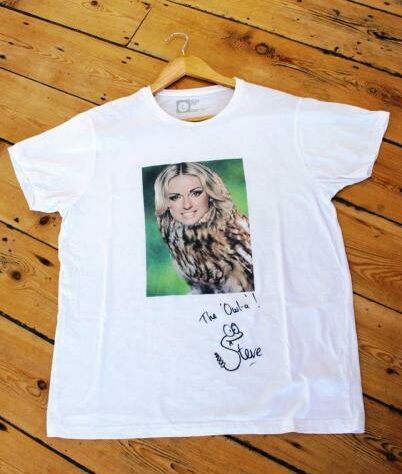 Among the 16 T-shirts is one sporting an owl with the face of Ola Jordan, Steve’s ballroom dancing partner in Strictly. The ‘Owla’ shirt is currently on display in the window of WLT’s office in Halesworth – and attracting plenty of attention! The auction opened on Thursday 2 April and closes at 11am on Sunday 12 April. 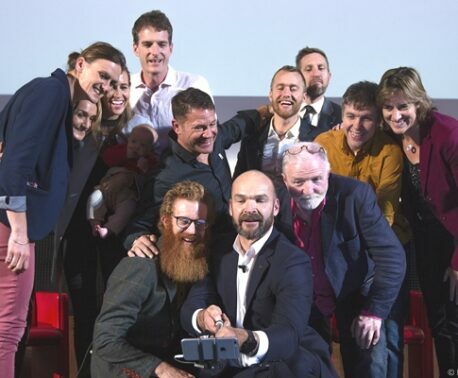 The auction has now finished – thank you to everyone who placed a bid. Money raised from the auction will be used to sponsor Steve’s entry in the Devizes to Westminster International Canoe Race. Over the Easter weekend Steve will be racing with fellow paddler George Barnicoat in a demanding 125 mile kayaking marathon, from Devizes in Wiltshire, along the Kennet and Avon canal and the River Thames. The race will take approximately 20 hours to complete, and WLT will be holding a supporter rally in Westminster on Sunday 5 April to cheer Steve over the finish line. There are plenty of ways to support Steve in the run up to the DW, during the race and afterwards.